How is the Name Zoram Connected with Pride? It doesn’t take long for readers of the Book of Mormon to come across the name Zoram (see 1 Nephi 4:35). Zoram was Laban’s important servant, the official guard of the treasury where sacred records were housed. But he chose to become a free man by joining Lehi’s family and journeying with them to their promised land. 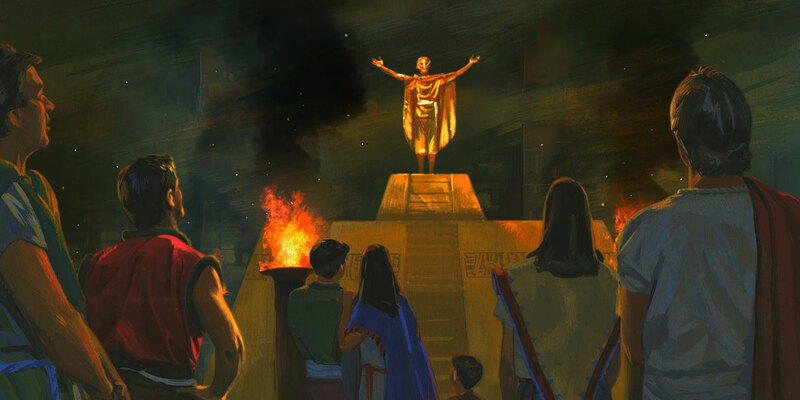 Not much is revealed about Zoram, except that he was a “true friend” to Nephi and that, despite having been an outsider to Lehi’s group, he became one of the seven founding tribal heads of Lehi’s people. Although Zoram was apparently a righteous man, some of his descendants caused problems for the Nephites, and it seems that Mormon may have used a pun on Zoram’s name to emphasize this point. After analyzing the name Zoram in light of ancient Semitic languages, Matthew L. Bowen suggested that it “could … plausibly denote ‘the one who is high/exalted’ or ‘He of the Exalted One’.” Although Zoram was likely meant to be a praiseworthy name, Nephite authors instead associated it with pride and vanity. Evidence for this connection can be found in a number of Book of Mormon passages but is perhaps most apparent in the story of Alma’s mission to the Zoramites. Figure 2 Zoram the servant of Laban. Painting by James Fullmer. When Alma and his missionaries arrived in the land of Antionum, they found that the Zoramites had perverted the righteous traditions of the Nephites. This included the offering of vain prayers on an elevated platform called the Rameumptom (Alma 31:21). From this platform, which was “high above the head” (v. 13), the richly dressed Zoramites boasted about their supposedly holy and elected status. Notably, the term ram at the beginning of “Rameumptom” is probably the same basic element in Zoram that means “high” or “exalted” in Hebrew. The dual presence of ram in this context makes the possibility of intentional wordplay especially likely. An additional line of evidence can be seen in the fact that Alma, on two separate occasions, contrasted the Zoramites’ prideful behavior with righteous themes of being “lifted up.” In the first instance, Alma compared the hearts of the Zoramites, which were “lifted up were lifted up unto great boasting, in their pride,” with his own righteous prayer, in which he “lifted up his voice to heaven” (Alma 31:25–26). In the second instance, Alma counseled his son Shiblon to not be “lifted up unto pride” or “pray as the Zoramites do” (Alma 38:11, 13). He contrasted this with the promise that Shiblon would be “lifted up at the last day” if he remembered to put his “trust in God” (v. 5). Yet further evidence for an intended wordplay comes from the way that the names Cezoram and Seezoram (each a variant of Zoram) are associated with being proud and lifted up. It was in the context of the assassination of a chief judge named Cezoram that the people “began to seek to get gain that they might be lifted up one above another” (Helaman 6:15–17). Likewise, it was during the reign of Seezoram that the Nephites were “lifted … up beyond that which is good” (Helaman 7:26). Thus, during the tenure of these leaders—each with Zoram-associated names—the Nephites began to be lifted up in wickedness much like the prideful Zoramites. Figure 3 Zoram the Leader of Dissenters by James Fullmer. In light of these and other textual evidences, it seems apparent that the Zoramites came to be associated with the “high” and “exalted” connotations of their own name. Yet, instead of being high or holy in a positive way, they were “lifted up” unto gross pride and vanity. In particular, the Zoramites became a symbol of the type of pride that stems from greed, materialism, worldly success, and a false sense of personal or collective righteousness. It should be understood that ancient Hebrew authors didn’t just use puns for amusement. Instead, the use of wordplay was often meant to help establish and reinforce important narrative themes. In this case, the story of the Zoramites, including the clever pun on the name Zoram, can help us remember the dangers of boasting in our own strength or being lifted up in the pride of our hearts. It was this type of pride that led the Zoramites and Nephites to destruction. And if we are not careful, the same pride will lead societies in our own time to the same dismal fate. President Dieter F. Uchtdorf taught, “Pride is the great sin of self-elevation. It is for so many a personal Rameumptom, a holy stand that justifies envy, greed, and vanity.” How can we ensure that we don’t fall into the same prideful condition as the Zoramites and Nephites? One way is to deflect praise and glory away from ourselves and towards God. For example, when an individual called Jesus “Good Master,” Jesus “said unto him, Why callest thou me good? there is none good but one, that is, God” (Matthew 19:17). Likewise, Ammon the Nephite missionary was once warned about boasting in himself, yet Ammon explained that he was actually giving all his praise to “the Most High God” (Alma 26:14). As we keep our focus upon the Lord’s goodness and away from our own achievements, the Lord will help us see our true eternal value and worth as His children. In this condition, we won’t feel we need to lift ourselves up in pride. This is because, like Shiblon, we can trust that the Lord will do all the lifting for us—meaning He will graciously lift us up unto eternal life—if we keep the commandments and faithfully “put our trust in God” (Alma 38:5). Matthew L. Bowen, “‘See That Ye Are Not Lifted Up’: The Name Zoram and Its Paronomastic Pejoration,” Interpreter: A Journal of Mormon Scripture 19 (2016): 109–143. Parrish Brady and Shon Hopkin, “The Zoramites and Costly Apparel: Symbolism and Irony,” Journal of the Book of Mormon and Other Restoration Scripture 22, no. 1 (2013): 40–53. Sherrie Mills Johnson, “The Zoramite Separation: A Sociological Perspective,” Journal of Book of Mormon Studies 14, no. 1 (2005): 74–85, 129–30. This description of Zoram comes from Lehi, who also declared, “Wherefore, because thou hast been faithful thy seed shall be blessed with his seed” (2 Nephi 1:30–31). On one level, it seems that Lehi may have compared Zoram to Jonathan in the Old Testament who “loved [David] as his own soul” (1 Samuel 18:3) and who said to David, “we have sworn both of us in the name of the Lord, saying, The Lord be between me and thee, and between my seed and thy seed for ever” (1 Samuel 20:42). For an extended comparison between Nephi and David, see Book of Mormon Central, “Why Was the Sword of Laban So Important to Nephite Leaders? (Words of Mormon 1:13),” KnoWhy 411 (February 27, 2018). See Book of Mormon Central, “Why Did Lehi Divide His People into Seven Tribes? (Jacob 1:13),” KnoWhy 319 (May 29, 2017). These seven tribes are always listed in the same order, with the Zoramites being placed between the groups affiliated with the Nephites and Lamanites: Nephites, Jacobites, Josephites, Zoramites, Lamanites, Lemuelites, and Ishmaelites” (Jacob 1:13). This middle placement is perhaps symbolic of Zoram’s outsider status, as well as the fact that Zoram’s descendants weren’t fully committed to either the Nephites or the Lamanites throughout the long history of their conflicts. These descendants at least included the dissidents Amalickiah and Ammoron (Alma 54:23), and mostly likely the apostate Zoramites who were named after a man name Zoram (Alma 30:59), who himself was presumably a descendent of the Zoram who accompanied Lehi’s journey to the New World. See also, Sherrie Mills Johnson, “The Zoramite Separation: A Sociological Perspective,” Journal of Book of Mormon Studies 14, no. 1 (2005): 76. It should be noted, however, that not all Zoramites throughout the history of the Book of Mormon were wicked (see 4 Nephi 1:36–37). Matthew L. Bowen, “‘See That Ye Are Not Lifted Up’: The Name Zoram and Its Paronomastic Pejoration,” Interpreter: A Journal of Mormon Scripture 19 (2016): 114. See Bowen, “‘See That Ye Are Not Lifted Up’,” 125–127. See Bowen, “‘See That Ye Are Not Lifted Up’,” 128–131. See Bowen, “‘See That Ye Are Not Lifted Up’,” 132–135. See Bowen, “‘See That Ye Are Not Lifted Up’,” 135–137. For an example of how the Zoramites’ pride led them to be ironically defeated in battle, see Parrish Brady and Shon Hopkin, “The Zoramites and Costly Apparel: Symbolism and Irony,” Journal of the Book of Mormon and Other Restoration Scripture 22, no. 1 (2013): 40–53.